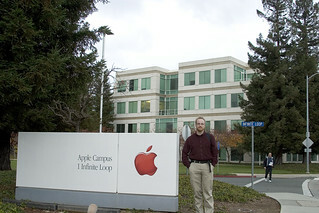 Me outside of Apple Computer in Cupertino. They have rabid tresspassing signs so this is as close as I could get. I really should have set up an off-camera flash like I'm learning to do at strobist.blogspot.com/2006/02/welcome-to-strobist.html.